Eyeglasses as we know them today, with side pieces that rest on the ears, were invented in 1727 by an Englishman named Edward Scarlett. Until that time, reading aids were often perched precariously upon the nose or were hand held. A “quizzing glass” was a single magnifying lens on a handle which was held up before the eye to enable closer scrutiny of the object in view. The quizzing glass is not to be confused with the lorgnette, which has two lenses, and more often than not a correctable (prescription) lens rather than a simple magnifier. A monocle is also a single-lens device but is meant to fit into the eye socket and therefore does not have the longer handle of the quizzing glass, which was held in front of the eye. The earlist examples of single-lens hand-held reading devices date back to the 12th century and were simple affairs with bone or brass handles used by scholars and clerks. It was not until the mid-18th century that they developed into a fashionable accessory, designed and worn as a piece of jewelery. (See Fig. 1) The quizzing glass generally dangled at the end of a long ribbon or chain around the neck and was held up to the eye to “quiz” (stare, glance, look at quizically) people and objects. The wearer would sometimes glare at a person through his or her quizzing glass as a manner of set-down or mockery, as seen in the detail from Vernet’s “Les Deux Incroyables” shown in Fig. 2. The term “quizzing glass” came into use toward the end of the 18th century. It is sometimes assumed that quizzing glasses were used only by men as they are most often associated with fashionable dandies of the Regency and Victorian eras, such as “The Exquisite” shown in Fig 2. However, the fashion prints of the Regency show ladies wielding them with as much aplomb as Beau Brummel. And those ladies are not the elderly dowagers one might imagine using such a device, but fashionable young women. In fact, the quizzing glass is such a common feature in fashion prints that it must be assumed that it was an extremely popular accessory. Most prints and portraits of women wearing quizzing glasses show them on a long gold chain around the neck. Men are frequently shown with a quizzing glass on a black ribbon, though gold chains are also used. A quizzing glass was as much a piece of jewelry as it was a functional vision aid. They were made of gold, sterling, pinchbeck, and other base metals, and were sometimes quite elaborate in design. The handles might be jeweled, or hold secret vinaigrettes or lockets (see Fig 3). The handle or its loop was often swivel-mounted to make it easier to lay flat when hung from a chain. Though the lenses were generally standard sizes, the handles were of varying lengths. (See Fig 4) Of course, the longer the handle, the more delicious the set-down. Quizzing glasses were almost always set with a magnifying lens, though some may have been set with a corrective lens since fashionable ladies and gentleman did not like to wear spectacles in public. Quizzing glasses were obtained from opticians and were usually kept in protective leather cases. (See fig 5) It is likely that the opticians set the lens in frames provided by goldsmiths or jewelers. Quizzing glasses reached a peak of popularity during the first two decades of the 19th century. Around the 1830s, lorgnettes became more popular for women. Quizzing glasses continued as a fashionable accessory for gentlemen through the beginning of the 20th century when monocles supplanted them in popularity. Grab yourself some film costumes bargains! An unusual auction of original film costumes from Jane Austen’s Persuasion and Miss Austen Regrets go under the Ebay hammer starting tomorrow 15th of March. In a surprising move BAFTA and EMMY award winning designer Andrea Galer has decided it is time to move on these much loved items. In colaboration with The Jane Austen Centre Online Giftshop, Ms Galer has handpicked many costumes and accessories that are likely to be fought over by Austen and film fans. Everyone can get involved as all of the items will start the auction at 99p! There will be a total of 21 lots spread over a 2 week auction window. I have found your white mittens; they were folded up within my clean nightcap, and send their duty to you. Several websites offer instructions for making your own mitts, including a crocheted pattern in our crafts section:Lacy Mitt Gloves. 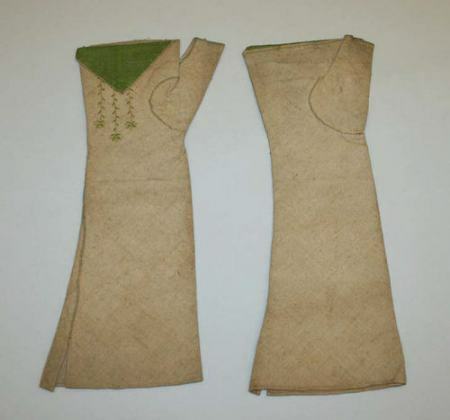 A firsthand look at mitt construction can be found here: Making 18th Century Mitts, while a pattern for sew mitts can be purchased from Kannick’s Korner. Velvet and lace Mitts can be purchased from our Jane Austen Centre shop in a variety of colors. Vic Sanborn oversees two blogs: Jane Austen’s World and Jane Austen Today. Before 2006 she merely adored Jane Austen and read Pride and Prejudice faithfully every year. These days, she is immersed in reading and writing about the author’s life and the Regency era. Co-founder of her local (and very small) book group, Janeites on the James, she began her blogs as a way to share her research on the Regency era for her novel, which sits unpublished on a dusty shelf. In her working life, Vic provides resources and professional development for teachers and administrators of Virginia’s adult education and literacy programs. This article was written for Jane Austen’s World and is used here with permission. Jane’s neice, Emma Austen Leigh, kept a diary list of all the gifts she was given over a period of years. It included jewelry, purses, knitting boxes and workbags along with a selection of fashionable accessories and mending tools. The chatelaine is a device which clips to the waist band or belt of a dress for holding such items as the mistress of the house would need with her throughout the day. It might include her seal, watch, scissors, thimble, a vinaigrette, and a key holder. A vinaigrette is a little tightly sealing box with a second pierced lid inside to contain a bit of gauze soaked in vinegar, lavender water, or other scent. Sniffing the contents were meant to revive someone feeling faint or give relief from unpleasant odors. It might be kept inside a reticule or be equipped with a loop and hung about the wearer’s wrist or from a chatelaine. Vinaigrettes were made by silversmiths specializing in boxes so they usually also made snuffboxes. There were smiths in London who did this type of work, but most boxes were made in Birmingham. Treat your friend to a Georgian style gift at our online shop – click here! With the upcoming release of Northanger Abbey, the last of Jane Austen’s six major novels to be filmed in the past few years, there is much questioning as to why Jane Austen, long the staple of high school English Literature classes, has become so wildly popular. In a world filled with rudeness and disrespect, she has gained not only a loyal following (though there has always been a faithful remnant), but worldwide media acclaim such as she did not experience even during her lifetime! “I was very lucky in my gloves–got them at the first shop I went to…and gave only four shillings for them; upon hearing which everybody at Chawton will be hoping and predicting that they cannot be good for anything, and their worth certainly remains to be proved; but I think they look very well.